[Episcopal News Service] Dixie Nelson, parish administrator at St. Matthew’s Episcopal Church in Alliance, Nebraska, was working at a motel several years ago when she got a call from a professor in California. He was planning to be in town on Aug. 21, 2017, and wanted to book some rooms – all the rooms. It was Nelson’s first taste of solar eclipse fever, which has since swept up her town and many more along the path of the coming total solar eclipse on Aug. 21. Episcopal churches along that path, from Oregon to South Carolina, are throwing out the welcome mat to eclipse-watching tourists this month, turning churchyards into campgrounds, hosting viewing parties and inviting the public to contemplate the mysteries of God’s creation. “God made the universe. This is one of his spectacular shows,” Nelson told Episcopal News Service by phone this week. She has been busy making arrangements for a makeshift campground at St. Matthew’s. By Aug. 21, the church property will accommodate campers at 30 RV sites and 26 tent sites. The congregation hopes to raise about $4,000 by collecting a suggested donation of $25 per night from some of the thousands of visitors expected to descend on this small city in Nebraska’s Panhandle. “The community’s been talking about it for years and getting ready,” said the Rev. Alice Nichols, rector at Grace Episcopal Church in Hopkinsville. Nichols said she has heard estimates that more than 100,000 visitors may converge in Hopkinsville on Aug. 21, which would quadruple the city’s non-eclipse population of about 32,000. She has contacted Episcopal churches across Kentucky inviting parishioners to come to Grace Episcopal to view the eclipse. Grace Episcopal isn’t offering camping, but visitors can pay $30 per adult and $15 per child to reserve one of 75 parking spots and join the church viewing party, with proceeds benefiting the church’s Graceworks ministry. Grace Episcopal also will offer its guests a boxed lunch before the total eclipse begins at 1:24 p.m. Eye protection is included as well. Nichols stocked up with 300 certified sunglasses, a must for anyone wishing to view the eclipse. Solar eclipses are not unusual. Partial solar eclipses can occur several times in a year, as they will in 2018. In a partial eclipse, the moon passes in front of the sun but does not block it altogether. 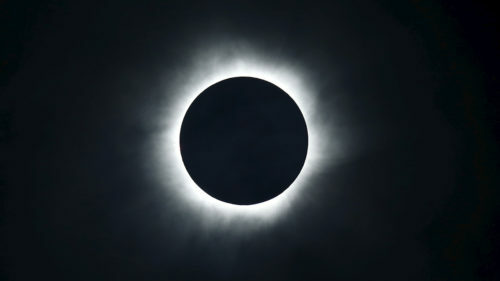 A total solar eclipse is rarer, occurring only when the moon passes fully in front of the sun, darkening part of the Earth and creating a thin, shimmering corona around the edges of the moon. Nowhere in the world will experience a total solar eclipse again until July 2019, when South America will get its turn in the shadow. The eclipse this month is generating additional excitement in the U.S. because it is the rare total solar eclipse that will only be experienced in this country, and from coast to coast. Peak eclipse, known as totality, will only occur on a narrow swath of the country and will last less than three minutes. The longest duration of totality will occur near Carbondale, Illinois, making that another top destination for eclipse watchers. St. Andrew’s Episcopal Church in Carbondale is holding a cosmic-themed hymn sing the evening before the eclipse, and the church is raffling an eclipse quilt. Over in the Diocese of Oregon, campers are invited to pay $250 for the privilege of staying in the path of totality in Silverton, home of St. Edward’s Episcopal Church. Included in that price is space enough for an RV up to 30 feet, two pairs of sunglasses and access to St. Edward’s labyrinth. The real reward, though, is viewing “the most beautiful thing you can see in the sky,” as one astronomer described the corona to NPR. Not able to travel on Aug. 21? A partial eclipse will be visible across all of North America. If you’re in Spokane, Washington, the Episcopal Church of the Resurrection invites you to their viewing party starting at 10 a.m. If you’re in Lexington, South Carolina, the Episcopal Church Women of St. Alban’s Episcopal Church want you to join them starting at noon. Those two churches are both in the zone where it will be possible to see an eclipse of more than 90 percent – weather permitting, of course. “I’m afraid to look at the forecast,” said Nichols, the rector in Hopkinsville. Fair weather odds is one of the selling points for Nebraska, where Alliance is promoting itself as offering better than an 80 percent chance of clear skies on Aug. 21. As parish administrator, Nelson, 63, typically spends most of her time producing St. Matthew’s newsletter, helping church committees, updating Facebook and taking care of other church business. Lately, eclipse planning has taken over her days, as the congregation prepares its 56 campsites. The church took reservations for minimum three-night stays, so the excitement will stretch across the weekend that leads up to the eclipse, which falls on a Monday. The St. Matthew’s outreach committee will serve breakfast to campers that Sunday and Monday, and a cookout is planned for Sunday evening. The city began stepping up its preparations about six months ago, Nelson said. Hotels are all booked, eclipse-related events are scheduled over the weekend and Nebraska Gov. Pete Ricketts is expected to make an appearance. Many of her neighbors underestimated at first what the eclipse would mean for Alliance, but they’re now bracing for a big turnout.